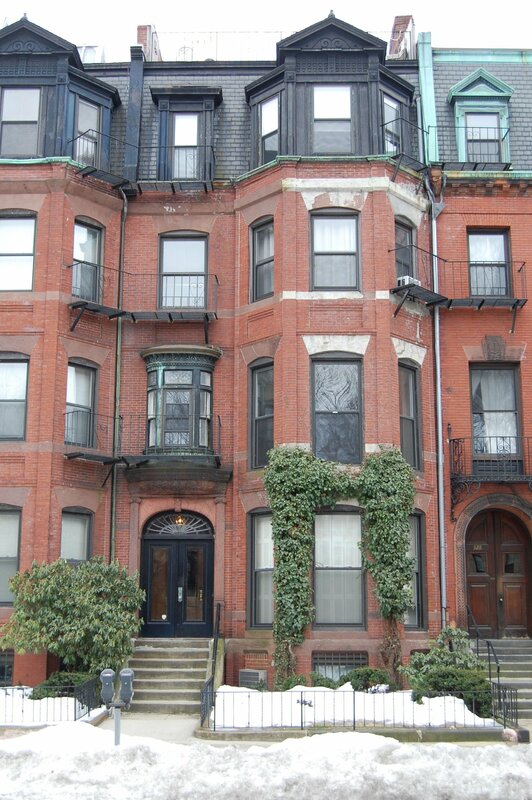 326 Commonwealth is located on the south side of Commonwealth, between Hereford and Massachusetts Avenue, with 324 Commonwealth to the east and 328 Commonwealth to the west. 326 Commonwealth was designed by Bradlee, Winslow, and Wetherell, architects, and built in 1882-1883 by Vinal & Dodge, masons, for building contractor George Wheatland, Jr., for speculative sale. It was one of three contiguous houses (322-324-326 Commonwealth) built in the same design, and one of sixteen houses (322-326 Commonwealth and 336-360 Commonwealth) built on the same block for George Wheatland, Jr., in 1882-1884. George Wheatland is shown as the owner on the original building permit application for 322 Commonwealth, dated September 20, 1882. George Wheatland, Jr., purchased the 72 foot wide parcel for 322-324-326 Commonwealth on April 19, 1880, from John Worster. On August 6, 1880, he entered into a mortgage with his father, George Wheatland, Sr., of Salem, and on December 1, 1880, he released his interest in the land to his father. He then built the three houses on the land and they were sold by his father to individual purchasers. John Worster had purchased his land on October 22, 1877, from Albert Fernald. It ran between Commonwealth and Newbury, and was an irregular shape, with the eastern line parallel to Hereford and the western line running southwest from Commonwealth at approximately a 45 degree angle parallel to the former Parker Street (Cross Dam) further to the west. The northern boundary of this parcel was 44.75 feet on Commonwealth and the southern boundary was 199.77 feet on Newbury. The parcel was originally part of a larger tract of land Nathan Matthews had purchased on January 2, 1871, from David Sears, Jr., Frederick R. Sears, and Knyvet Sears. On December 17, 1878, John Worster and David N. Skillings, who owned the land to the west, exchanged triangular shaped lots to “square off” their respective holdings so that the north-south boundary ran in a straight line rather than at an angle. David Skilling’s land was part of a parcel he had purchased on December 16, 1870, from the Boston Water Power Company. 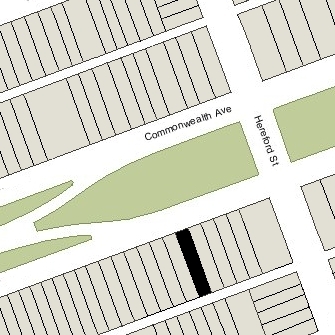 The boundary of the triangular lot on Commonwealth was 40.66 feet wide and, when combined with John Worster’s other land, created a rectangular lot 85.41 feet wide. John Worster sold the eastern 13.41 feet in October of 1879 to Frank Thayer and William Lincoln (who combined it with other land they owned) and sold the western 72 feet in April of 1880 to George Wheatland, Jr. John Worster retained the land to the south, and in his deed to George Wheatland, Jr., he included language specifying that, for a period of ten years, no stable would be built on his land on Newbury without the consent of the owners of the land he was selling on Commonwealth. Click here for an index to the deeds for 326 Commonwealth, and click here for further information on the land on the south side of Commonwealth between Hereford and Massachusetts Avenue. 326 Commonwealth was not listed in the 1884 Blue Book. On October 8, 1883, 326 Commonwealth was purchased from George Wheatland, Sr., by real estate dealer Brice Shepard Evans, and on the same day, it was acquired from him by real estate dealer Samuel Horatio Whitwell. On December 10, 1883, 346 Commonwealth was purchased from Samuel H. Whitwell by Lewis Brooks Bailey, one-half in his own name and one-half in his capacity as trustee for his sister, Elizabeth, under the will of their mother, Mary (Hall) Bailey, widow of Lewis Bailey. He and his sister made it their home. 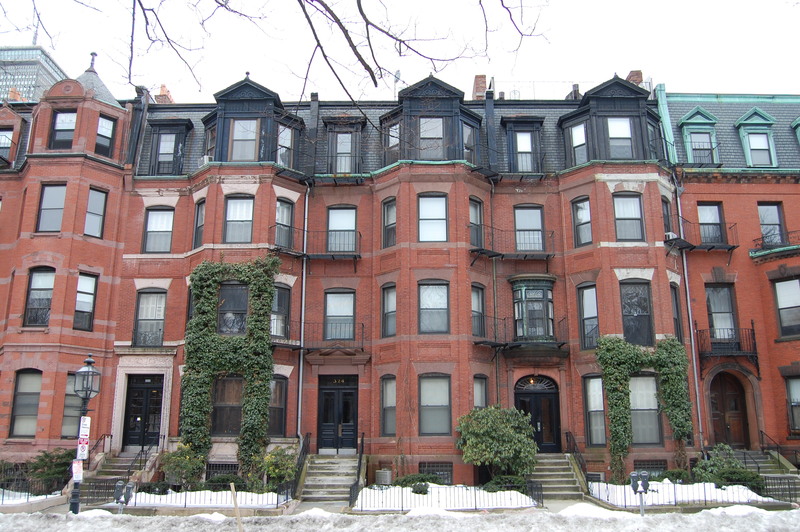 They previously had lived at 55 Bowdoin with their mother, who had died in October of 1882, and their sister, Mary, who had died in August of 1883. Lewis Bailey married in April of 1884 to Anna Lawrence Hamilton. After their marriage, they lived at 326 Commonwealth with his sister. They were joined by Anna Bailey’s sister, Virginia (Hamilton) Forster (called Foster in the Blue Books), the widow of Theodore Forster, who had died in January of 1883 in St. Louis. Lewis Bailey managed his family’s real estate. He died in November of 1888. Anna (Hamilton) Bailey, Virginia (Hamilton) Forster, and Elizabeth Bailey continued to live at 326 Commonwealth during the 1888-1889 season, but moved thereafter. By the early 1890s, Elizabeth Bailey was living at the Hotel Bellevue at 19-23 Beacon, and Anna Bailey and Virginia Forster were living in St. Louis, where they had been born. On February 26, 1889, 326 Commonwealth was purchased from Lewis Bailey’s estate and heirs by Frances (Fannie) Ann (Holden) Tinkham, the wife of wholesale produce merchant George Henry Tinkham. They previously had lived at 74 Montgomery. His sister, Abbie A. Tinkham, lived with them. The Tinkhams raised their three surviving children at 326 Commonwealth: George Holden Tinkham, Rebecca Warren Tinkham, and Madeleine Tinkham. Rebecca Tinkham married in January of 1902 to Stuart Warren Cramer, an engineer from Charlotte, North Carolina, where they lived after their marriage. George Henry Tinkham died in June of 1904. Fannie (Holden) Tinkham, George Holden Tinkham, Madeleine Tinkham, and Abbie Tinkham continued to live at 326 Commonwealth. George Holden Tinkham was a lawyer. He served as a member of the Boston Board of Aldermen from 1900 to 1902, as a member of the Massachusetts State Senate from 1910 through 1912, and as a member of the US Congress from 1915 to 1943 (he did not stand for re-election in 1942). Madeleine Tinkham married in April of 1910 to Loris Almy Miller, a bond broker from Chicago, where they lived after their marriage. By 1920, they had returned to Winchester and by the 1921-1922 winter season were living at 369 Marlborough. They also continued to maintain a home in Chicago. Abbie Tinkham died in March of 1913, and Fannie Tinkham died in December of 1923. 326 Commonwealth was inherited by George Holden Tinkham, Rebecca (Tinkham) Cramer, and Madeleine (Tinkham) Miller, and in April of 1926, George Tinkham acquired his sisters’ interests. George Holden Tinkham continued to live at 326 Commonwealth and Washington DC until about 1940, when he moved to 369 Marlborough to live with Madeleine (Tinkham) Miller. On November 30, 1939, 326 Commonwealth was acquired from George Holden Tinkham by Settalkel (Sally) G. (Maloof) Maloof, the wife of real estate dealer and importer George S. Maloof. On December 9, 1939, 326 Commonwealth was purchased from Settalkel Maloof by Harvey Willard Forbes, a milk dealer, and his wife, Margaret A. (McGowan) Forbes. They lived in Melrose. In January of 1940, he applied for (and subsequently received) permission to convert the property from a single-family dwelling into five apartments and a doctor’s office. The property changed hands and on December 29, 1941, was acquired by Louis Rockwell Chadbourne, a wholesale fuel oil salesman. He and his wife, Ethel Victoria (Smith) Chadbourne, lived in Medford. On March 13, 1959, 326 Commonwealth was purchased from Louis Chadbourne by Yale Goldman and his wife, Norma (Basil) Goldman. They lived in Newton. He was district manager for the Penn Mutual Life Insurance Company. The Goldmans also owned 324 Commonwealth. The property changed hands and on August 17, 1964, it was acquired by Robert White. He already owned 324 Commonwealth, and subsequently purchased fourteen additional houses on the block. By December of 1978, he owned 322–324–326–328–330–332–334–336 Commonwealth, 344-346-348–350 Commonwealth, and 354–356–358–360 Commonwealth. In December of 1988, he applied for (and subsequently received) permission to convert 326 Commonwealth from five apartments and a doctor’s office into ten apartments. At the same time, he also applied for (and subsequently received) permission to combine it with 322-324 and 328-330-332-334 Commonwealth into one property with 63 apartments, to be known as 322-334 Commonwealth. 336 Commonwealth remained a separate property. 326 Commonwealth remained an apartment building in 2018.